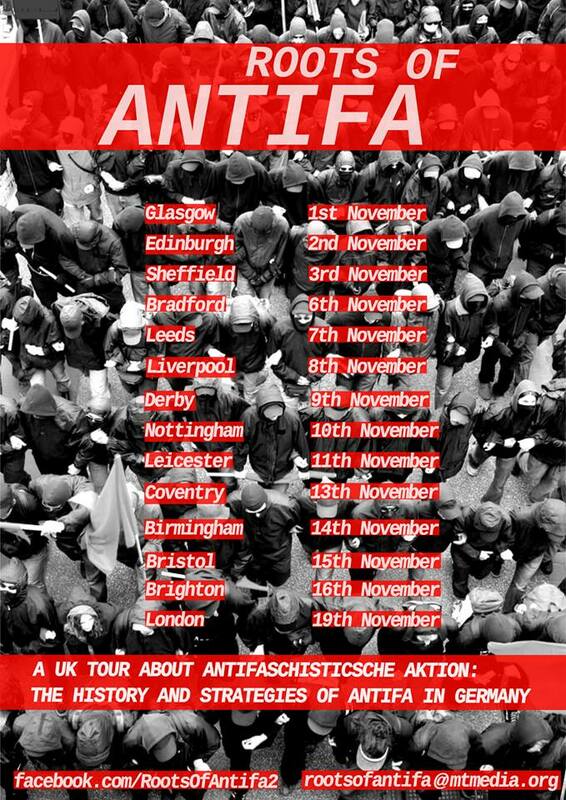 A UK tour including fourteen presentations on the History and Strategies of Antifa in Germany is kicking off in Glasgow tomorrow with an event hosted by Plan C Glasgow at the Glasgow Autonomous Space. The rise of fascist movements and parties all over Europe has once again made it clear: organised antifascist resistance is necessary. In order to successfully intervene and stop fascism from spreading, it is useful to take a look at the different experiences built from movements in other countries, particularly the history of the Antifa movement which originally started in 1930’s Germany. All events will include discussions about the lessons there are for the movement here, going forwards in 2017. The speaker, who is a member of the “ums Ganze!” Bündnis and has been part of antifascist initiatives and organisations for more than ten years, tries to present the major strategies, struggles, defeats, victories, splits, and theories of the Antifaschistische Aktion from 1932 to the present.